Companies in Automotive Repair and Maintenance Industry are known for providing repair and maintenance services for the truck, passenger cars, and other vehicles. According to Future Market Insights, the global automobile repair and maintenance industry are expected to grow by the double-digit compound yearly rate by 2025. This industry has increased demand in emerging markets like China and India. There are about 160,000 establishments in the U.S automotive repair and maintenance industry segment. That is, it makes up to a combined annual revenue of nearly $105 billion. The massive growth in vehicle production is the main factor that influences the demand for this industry. If you wish to explore business opportunities in this sector, we are here to help you. Blue Mail Media offers the highly reliable and accurate Automotive Repair and Maintenance Industry Mailing List for your benefit. You are at the right place if you are planning to tap into Automotive Repair and Maintenance Industry. We, at Blue Mail Media, provide the best email list that lets you reach all the key decision makers as well as top-level executives in this area. 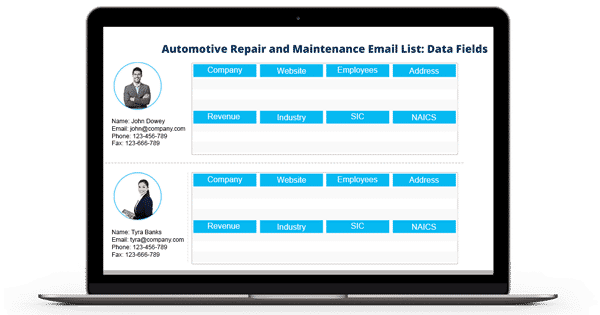 Our Automotive Repair and Maintenance Service Mailing List have all the essential marketing information that lets you begin with your marketing operation. We provide your prospects first name, last name, company information, SIC Code, and many more. Also, our list is designed to stay compliant with GDPR and Anti-Spam law. We have an expert team who conducts the various quality check as well as verification to keep Automotive Repair and Maintenance Industry Email Database updated and clean. To maintain the trustworthiness of the list, they gather the data from various authentic sources. It includes government records, surveys, yellow pages, business directories, trade shows, conferences, and more. Besides, you can target clients from various regions across the globe. The places include North America, Europe, ASIA, Australia, New Zealand, Africa, the Middle East, and South America. Hence avail our Automotive Repair and Maintenance Industry Executives List and see a positive difference in your sales rate.